It's been a tough winter for the plants, with little snow cover and a constant cycle of rain and hard freezes. Small bulbs and plants were heaved out of the ground and had to be reburied. On a positive note, my Giant Snowdrops were up and blooming early in January. At some point, however, it is time for a desperate gardener to visit a nursery to get a plant fix! 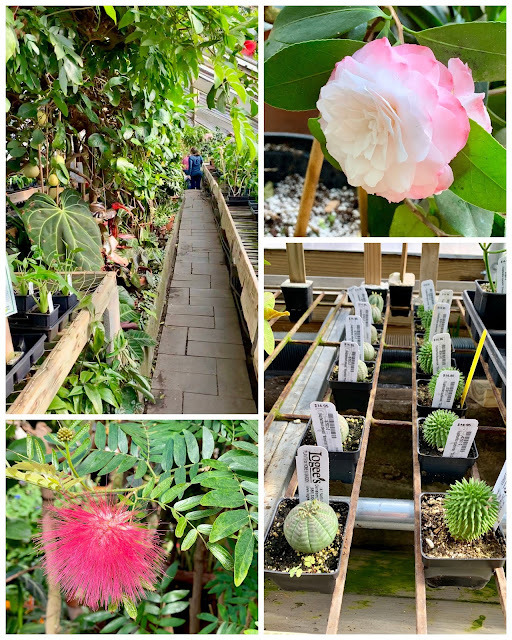 We are lucky to have a couple nurseries with greenhouses in the surrounding area, but last month we took a day trip to visit the real jackpot - Logee's Greenhouses. Mr. Red House took me to Logee's as a late Valentine's Day excursion. He really knows the way to a gardener's heart! 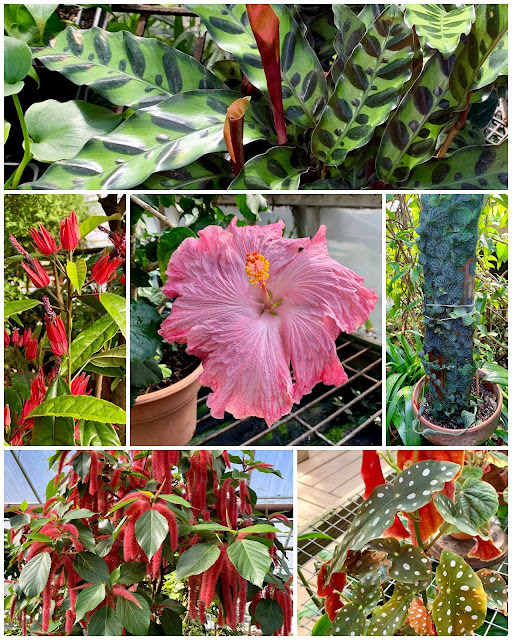 Logee's has not just one but SIX greenhouses filled to the brim with botanical treasures. Logee's is a mail order and retail shop in Danielson, Connecticut, that specializes in container-grown tropical plants, and it has an interesting history. It was started in 1892 by William Logee. One of its most famous plants is the Ponderosa Lemon Tree that was brought to Logees from Philadelphia in 1900 via train then horse and buggy. It was planted in the ground in Logee's original greenhouse and is still there, alive and thriving, and thousands of cuttings have been taken from it for new plants. It is also called the American Wonder Lemon, as its lemons can get as large as 5 pounds. William Logee's children became involved in running the nursery. His son Ernest hybridized begonias for the nursery and was one of the founders of the American Begonia Society. Sadly he passed away at a young age from a fall out of a tree while pruning. William Logee's daughter Joy met her husband at Ernest's funeral, as he was a fellow horticulturalist and Begonia Society member. They became owners of the nursery after William's death in 1952. Joy focused on scented geraniums and herbs, while also continuing her brother's legacy of growing begonias. Joy and her husband had two sons. One, Geoffrey, became a physicist and professor. His first wife was now well-known garden author Tovah Martin. Their other son Byron stayed with Logee's, and he and his first wife now run the still family-owned and operated greenhouses. The nursery was a delightful place to visit after some long winter months. So is it possible for a plant-starved gardener to visit such a greenhouse and not come home with a plant or two (...or seven or eight)? Sounds like a great nursery. Of course you didn't come home emty handed. I hope spring arrives soon in your part of the world. Me too! Temperatures are slowly rising, so I hope it won't be long! Now that's a big lemon! I can imagine a trip to that nursery must be a joy, not just in winter. We haven't had a real winter this year. I hope your cold winter days a really over now. I hope so too! It is supposed to get warmer by the end of this week. Let's hope it stays that way! I love going to Logee's and like you, cannot get out of there without dropping a fair amount of change! Mr. Greenhouse was very kind. :) We had some very dramatic freeze/thaw cycles, too. Your Snowdrops look healthier than mine. I need to re-plant some Hellebores that really heaved during the winter. Have a great week! My snowdrops look a little more frazzled now after a few more of those cycles. It is impressive how hardy those little things are though. 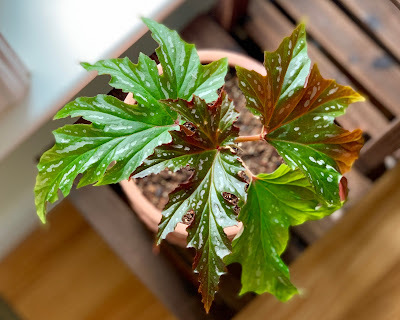 My begonia needs some kindness. Love lush and beautiful leaves. Logee's had so many different types of begonias. So many beautiful leaves! I ended up bringing two of them home. Interesting to hear about what gardeners in climates with winter do all winter. I think, though, you have the advantage of being able to think and plan, of having to think and plan to make the most of your shorter growing season. That has its own advantages. Where I am we can garden year round, and when there is always something to do, planning is often neglected. Thank you for the pictures and history of Logees. I have always wondered about that company. 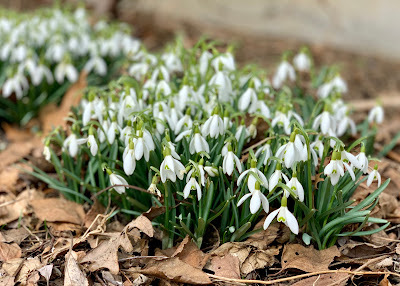 I used to garden in North Carolina, and I do like having the winter to rest and plan (even though it gets rather long sometimes). Gardening down south also requires more planning to have something in bloom over such a long season. Logee's was one of the featured nurseries in my first ever herb book. Over the years I have tortured patchouli, curry leaf,tuberose and scented geraniums with my cool house and zone 4 garden. Nice to see a family-operated local nursery still thriving. Our local nursery, a sentimental favorite, closed its doors last fall. There are others, but I will miss Anton's. I haven't yet made my first trip of the season to a garden center.